Enjoy - Food & Travel: Bolero Schwerin - no ring of fire! Tex-Mex is modified Mexican food to please the pallet of their Texan brothers and sisters north of the border. Whereas Mexican food can bring you into a culinary ring of fire, the tex-mex are spicy but not too hot. When bringing this kitchen over the Atlantic it may go both ways. Back to the cradle with generous amounts of chipotle and habaneros, or to the native (here German) kitchen. In Schwerin they call it tex-mex fusion food, and Bolero is one place they serve it. No ring of fire here! Dull as dishwater if you ask me! Welcome to Schwerin! 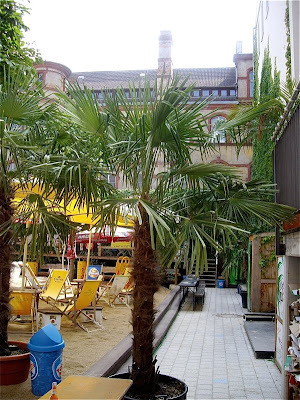 This grown up palm tree stood in a large pot in the courtyard behind Bolero in Schwerin, in order to bring the feeling of Cancun closer. The similarity with the atmosphere and the tastes of the Yucatan peninsula ends there. As it looked like it would rain, we went to sit inside. The contrast to the tropical atmosphere was striking, very dark and a rather boring and uninviting interior. As at La Oca in Sitges there were nearly no one there, except ourselves. The question I ask myself is when will I learn that just that is a bad sign and leave to find another place to eat . Well, over to the food, fusion food, no tex-mex, fusion food with no taste. So far away from Mexican food as absolutely possible. One chicken salad for my friend Ketil and one pasta carbonara for me. I think Ketil appreciated his salad, whereas I wondered what had gone into, or not had gone into my pasta carbonara. The coal burners pasta is the Italian equivalent to bacon and eggs. Pancetta, Italian streaky bacon, eggs, cream, Parmesan cheese, salt and pepper. At its best this is honest, filling, and tasty food. The salt derived from the bacon and Parmesan, immersed in a yellow, creamy, savoury custard with a good amount of pepper. 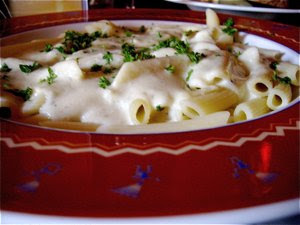 The carbonara at Bolero could not haven further away from its origins. It neither looked, nor tasted as a proper carbonara. White sauce, not yellow. Slightly overcooked penne, sauce lacked character. Where were the bacon and parmesan tastes - and pepper???? Why do restaurants serve food like this? Do the cooks lack tastebuds? Why? They had certainly not been burnt away in a ring of fire!! If the rest of the menu is as uninteresting as my pasta, no wonder why there were nobody there to eat. Schwerin is not a big city, but there are definitely better restaurants as Bolero, so go somewhere else to eat! It would probably be a better idea to go there for a drink, as there are a large bar area as well, and you can not go that bad mixing drinks - or can you?